In the Sunny Isles Beach Government Center parking lot at 18070 Collins Avenue, owners of electric cars may now charge a vehicle using the SemaConnect system. This new green initiative, the electric car charging station, is part of Mayor George “Bud” Scholl’s Technology Challenge! 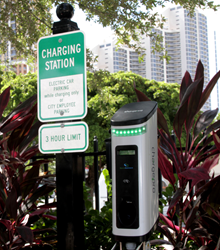 In the Sunny Isles Beach Government Center parking lot at 18070 Collins Avenue, owners of electric cars may now charge a vehicle using the SemaConnect system. This new green initiative, the electric car charging station, is part of Mayor Geroge “Bud” Scholl’s Technology Challenge! As part of Mayor George “Bud” Scholl’s Technology Challenge, the City of Sunny Isles Beach has installed a new Electric Car Charging Station at the Sunny Isles Beach Government Center. The City of Sunny Isles Beach is looking at ways to implement technology to improve the lives of our residents and visitors, and when that technology is also an environmentally friendly initiative, everyone wins! Residents and visitors with electric cars, can now use the new charging station, located at the southwest end of the Government Center Parking lot. Look for the sign marking the correct parking spot. To use the charging station, users must register to obtain a card from semaconnect.com. The card is FREE but must be loaded with $10 that can be used at any SemaConnect charging station. Once you have received your card you can begin using the station! Hold the card in front of the charging station screen to be read. The rate is $1/hour for a maximum of 3 hours. This particular charging station is a “rapid charger” and will charge much quicker than typical charging stations at one’s home. Users may sign up for text message notifications when they register on the SemaConnect website. These text messages will notify users when their car is finished charging. Users will also find interesting analytics on the SemaConnect website, as well as other nearby SemaConnect charging locations. For more information about the charging station or city programs, visit the City’s official website at sibfl.net, tune to SIBTV on Atlantic Broadband Channel 77 (107-5) or AT&T U-verse Channel 99 or follow the City on Twitter, Instagram & Facebook (@CityofSIB). For questions, please contact Cultural and Community Services at 305.792.1706.